Lettering Express has cultivated a passionate staff that nurtures every project through completion. From planning to production to installation, we make sure things get done correctly. Our company culture encourages our staff to not only continue to develop their skills but to also do the things they love. Taking this into account, you can always depend on our experience and friendly customer service. Lettering Express’ installation team is nationally recognized by all major manufactures: Avery, 3M, WrapItRight, Lowen and Orafol. There’s nuance to working with every kind of material. With our knowledge, we try to bring out the best in every job. MEET THE INDIVIDUALS WHO HELP BRING YOUR VISIONS TO LIFE. Rivers has been working in commercial lettering literally since birth. Sign-shop lore often references a child of prophecy that will be born near the outset of the 21st century. Is Rivers this child? Even the sages of color changes and vehicle wraps aren’t able to divine the future. Only time will tell what adventures await this boy. Truth be told, Rivers is the youngest member of our production team and a joy to work with. Jill possess a keen eye for quality and a love for all things local, which are useful traits for a person helming the front office of a family business that has existed in Oklahoma City since 1988. Jill graduated from the University of Oklahoma before going on to receive her MBA from the University of Central Oklahoma. Once, an online quiz titled “Which Pop Star Are You?” accurately declared she was Taylor Swift. Kanye West, however, would never want to interrupt Jill in the middle of an award acceptance speech. As the kids say, “Real recognize real.” Jill’s dedication to art, fashion and pop culture is only eclipsed by her commitment to Lettering Express’ clientele. Come see for yourself. Just because you’re recognized by the industry as one of its most trusted installers doesn’t mean you can’t be fun. Charlie brings joy to the world with a heat gun and his rainbow-colored assortment of wrap films. Watch Charlie skateboard to his job. Watch Charlie wrap a vehicle to complete that job. Watch Charlie answer a phone call to accept your next job. Watch Charlie do work and try not to blink as he collects accolades. He’s already Avery Dennison Certified, Arlon WrapItRight Certified, Lowen Certified, 3M Preferred, Knifeless Accredited and the list continues to grow. Justin combines his passion for service with a receptive ear, meaning customers have a tendency to get exactly what they’re looking for when he’s around. From the quiet Norman Oklahoma countryside, Justin drags the peacefulness of his surroundings to work every day. 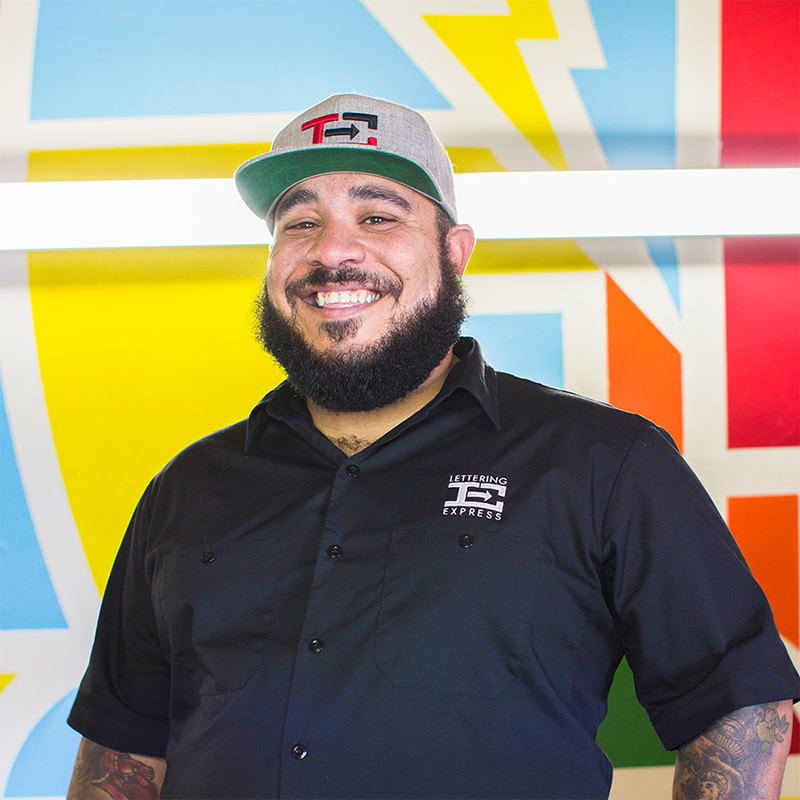 Some installers panic when dealing with the various challenges that go hand in hand with on-site installations, but that’s not Justin’s style. There’s little terrain that Justin hasn’t braved to get his jobs done. At times soft-spoken, Kate has the tendency to let her designs speak for themselves. Embracing art at an early age, Kate pairs creativity with technique. She combines her knowledge of fine art with a passion for hand lettering. Using a unique blend of skills, Kate lends her lively, human look to all her designs. She’s a breath of fresh air in an era where most apparel companies cut corners with easily-imitated templates. She’s also bilingual, meaning she can properly communicate the phrase “Let’s party!” all the way from Oxford to Mexico City. Caitlin likes challenges. In the past, when she wasn’t sitting behind a computer running nerdy t-shirt companies, you could find her behind a drum set learning beats for LCG and the X. Maybe it’s the desire to learn new things that brought her to Lettering Express’ apparel department in the first place. Maybe it’s same thing that dictates her free time be spent in the majesty of the outdoors, surrounded by mysterious kitty cats with a camera to capture it all. 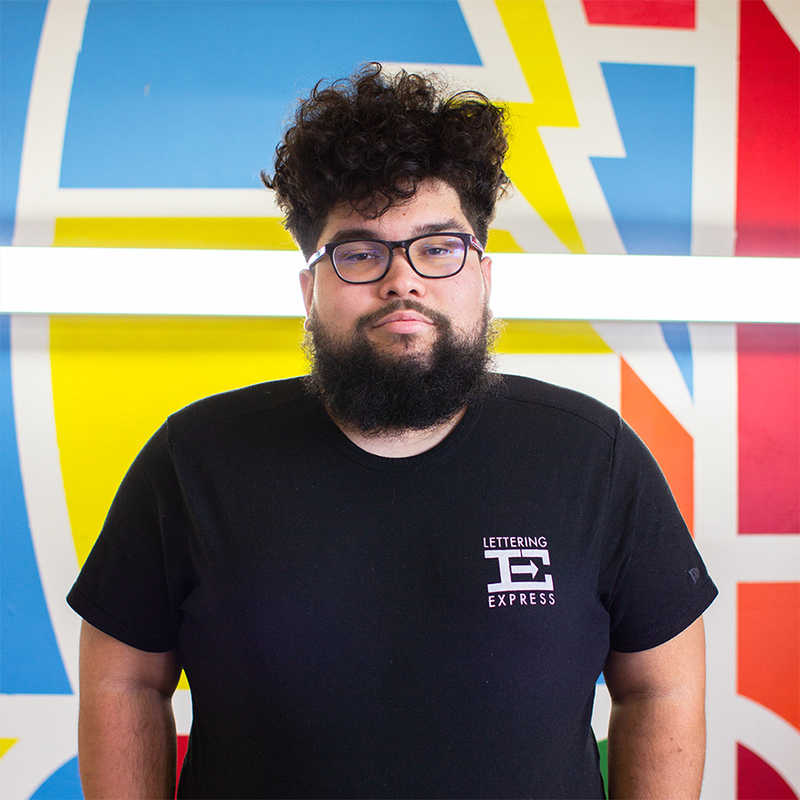 Brett graduated from UCO in 2014 with a degree in graphic design and a minor in illustration. A self-proclaimed optimist with a love of all things girly, Brett finds joy in challenging herself. She carries this attitude into her work. Where other designers see obstacles, Brett sees puzzles that she takes pleasure in unraveling. Outside of work, Brett loves literature, car singing, dancing while cleaning as well as chips and salsa. If she could combine all these things into one, we’re sure she would. After all, she’s a great multitasker. Davis draws in his bed. Davis draws on his days off. It only makes sense that this once would-be accountant would shun a career path littered with numbers to walk into an office that wants him to make art. From Yukon by way of Bahrain in the Middle East, Davis is a one-man band of creativity. Adept in both the drums and guitar, he’s literally that. And if he ever released an album, the odds are high that he’d make the art as well. When it comes to Lettering Express’ social media presence, Jade is our wizard behind the curtain. 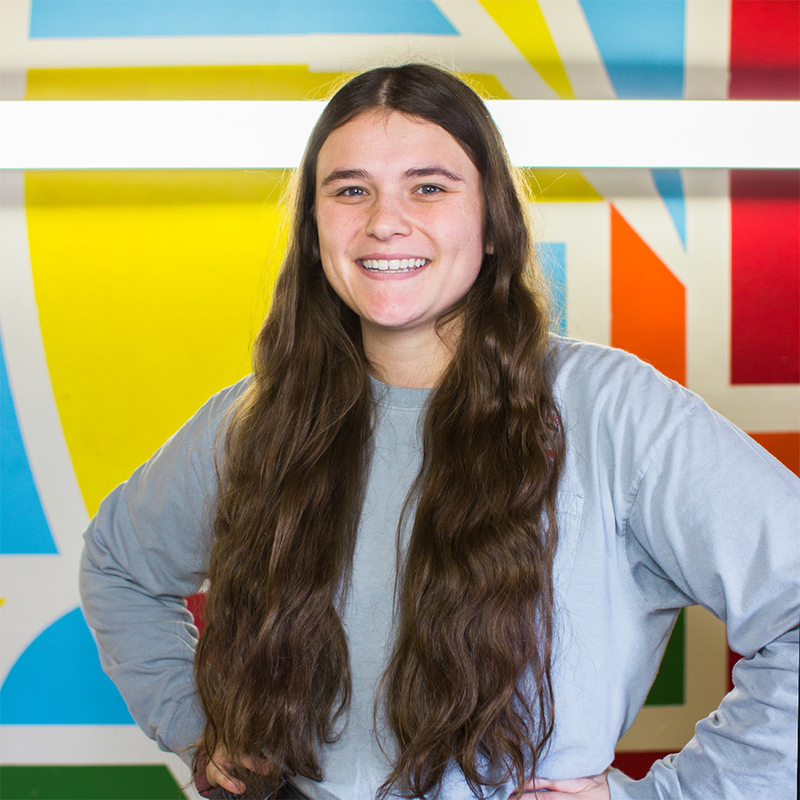 From her recreational interest in watching Youtube vloggers dissect different yogurt flavors to having academically studied the impact of the Internet on brand awareness, Jade has elevated her understanding of social media’s power. It’s a talent she wields on a daily basis for Lettering Express, highlighting our clients’ creative side while showcasing our company’s ingenuity in the process. Lettering Express’ ingenuity is something she’s been familiar with for a very long time, having grown up around the family business from the time she was a small child until now. From a crack in the fabric of reality, Luis left a life of Hyrulian escapades in his virtual past and ventured into our world. Here, he likes making music, designing graphics and producing videos. Maybe one day he’ll return to that place when that world needs its hero again. Until then, we’re glad to have him as our apparel print specialist. Amid developing a deeper sense of responsibility for those around him, Hunter also finds himself to be a more open person today than what he was when first entered the graphics industry. A little education will only hasten his this aspiration. Hunter also attends classes at Rose State College where he studies business. Prior to joining Lettering Express, Chris was a one-man wrapping machine, the best solo show in town. Now surrounded by other talented installers, Chris will finally have free time to explore his other interests, which include skating, playing piano and skating while playing piano. Chris is a talented dude. He could probably do it. Having arrived at Lettering Express straight out of high school, Alex is your typical 18-year-old. His immediate goals involve finding his own place, meeting new people in Oklahoma City and making money. Within the context of the sign industry, he wants to see how far his skills and ambition can take him. Looking to develop his installation skills for at least the next five years, Alex sees himself eventually behind a design desk in the future. Studying graphics at Eastern Oklahoma County Technology Center, Alex is hardly a novice. Though young, he’s a hybrid graphic designer/installer that approaches each project with thoughtfulness. Alex flocked to the sign industry because he’s an artist at heart. Immersing himself in art comes naturally to him, and being around commercial art for work was the next logical step. Alex spends most of his free time getting lost in sketchbook. As long as he has art, he’s mostly content with simple joys. “The ideal bachelor pad for me would be something small where I can just relax, make some art and get fat off candy,” Alex said. Alexis grew up printing t-shirts in her home for fun, making clothes for her personal use while fostering greater professional ambitions. Acknowledging her passion for apparel, she became Lettering Express’ new direct-to-garment print specialist with ease. Her career has just started, and her new job could possibly segue to designing clothes full-time. As a small child, Alexis would draw her designs on top of blank t-shirts, sometimes flipping t-shirts inside out in order to find extra surfaces for her to scrawl. Graduating from Eastern Oklahoma Technology Center in 2016, Alexis has only refined her skills and tastes. She strives for simple designs that exude beauty but don’t overwhelm. Even away from work, you can find her drawing in a sketchbook while staring at a lake somewhere in Oklahoma. Away from reality, in a daydream, she’s in art museum with Jason Segel, still honing her craft while taking a fictional stroll through a gallery or two. Barely out of high school, Korey Pugh already possess the height and length to become an elite world-class wrap specialist. Unfortunately for the graphics industry, he also possesses an aptitude for rhythm and meter to excel at a different kind of rapping. When he's not at the shop, you can find Korey in the studio behind a microphone or instrument. He wouldn't call it a hobby though, not when his five-year plan includes more brightly-lit stages and less vehicle installation bays. Until then, we are fortunate to have him on the LE team! Impeccably groomed, Cole Shipman ambles through Lettering Express' busy production spaces with a playful spring in his step. His to-do list is full of antics meant to inspire smiles from his co-workers, which can be a bit much on some days. It's a good thing work keeps him busy. The volume and variety of his tasks provide a needed outlet for this youthful energy. And if work isn't enough, Cole is setting fashion trends simply by existing. And if that's not enough, then he's off saving the world in his own way. Have you ever heard of recycling cans? Well, he's into that. Every day at Lettering Express is different, which has been a nice surprise for Cole in his adult life. When he was four years old, tedious wrestling practices took up a large chunk of his time. Now, he'd much rather wrestle shirts than people. They're softer and less sweaty. LA (Leslianne) came to Lettering Express looking to add on what is already a diverse list of experiences. Payroll companies and not-for-profits sit at the top of her resume, but she’s also gleaned random knowledge from professionally walking dogs, organizing fashion shows and photographing local hip-hop acts. Simply put, LA likes being busy. Perhaps, it’s this thirst for action that makes LA the perfect intermediary between Lettering Express and its clients. “I get to see the full creative process from beginning to end. I get to see people bring in their ideas, and each part of our company takes it and makes their idea come to life,” LA said. A musician at heart, Bryan English treats his customers the way he treats his bandmates: as if they were his people. By doing so, he creates harmony where lesser managers might settle for discord. His ability to work well with others has been paramount to both his professional and his musical career. By first identifying what others value, Bryan is able to hit the right notes in the office and on the stage. 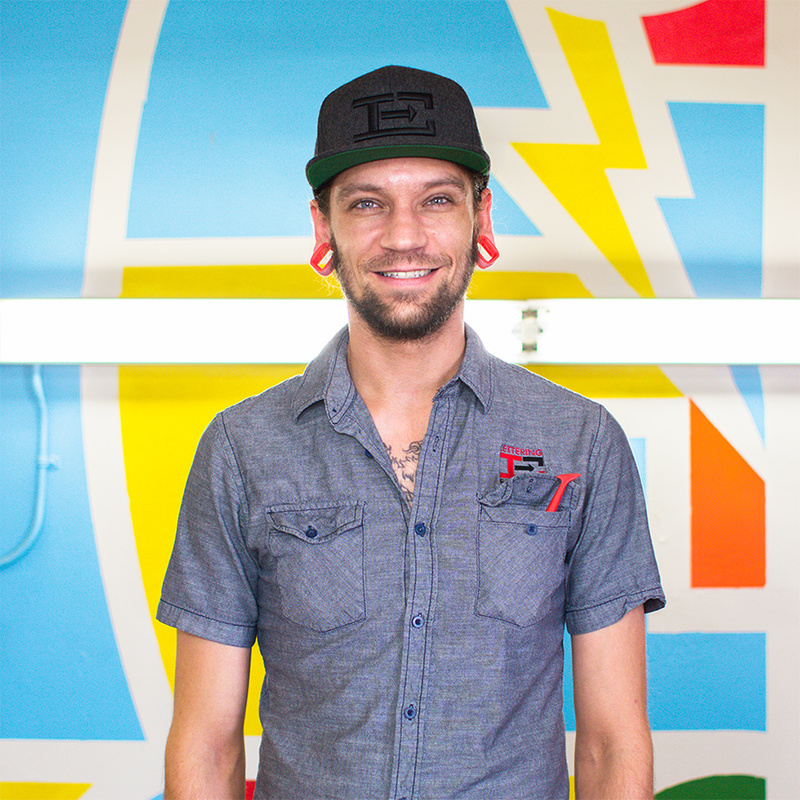 Bryan has worked in the graphics industry for eight years prior to coming to Lettering Express. He said his new surroundings have been more conducive his creativity. Also, the nearby Mexican restaurants that have become staples of his diet have probably contributed to his newfound happiness as well. Lettering Express, Erica Valadez greets every customer who enters and touches every order that leaves. She does this at various stages in a project’s development. There’s an unassuming clarity about the way she accomplishes her varied list of tasks: communicating with clients, invoicing payments and designing graphics with poise that belies her youth. Erica relies on perseverance, self-discipline and kindness to get through her day. One might wonder where she developed this strength. Perhaps, it comes from perspective. Away from work, she’s a young mother caring for a little boy. “Parenting doesn't come with a manual, and you don't get to clock out,” she said, contrasting her life at home and the office. With bean and cheese burritos flowing through his blood, Zach Zeller uses his quick wit and imagination to trouble shoot any problem his production staff might face. Though his job title is officially “plot manager,” Zach has become known as a big-hearted amateur inventor behind the scenes, finding creative solutions to technical problems. If he could, he’d build a food-duplication machine and feed the world. Away from the office, Zach has spent his time either running around Oklahoma City or globetrotting through Europe as a multi-instrumentalist/musician. The Non, Horse Thief, Husbands, Defining Times and Mikah Young are just a few bands that Zach has performed with.